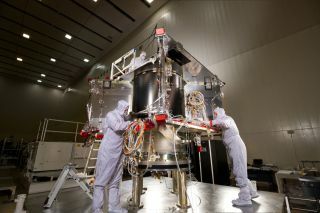 Lockheed Martin technicians in a clean room facility near Denver assembled NASA's OSIRIS-Rex asteroid-sampling spacecraft. The NASA spacecraft that will snag pieces of a near-Earth asteroid a few years from now is starting to come together. NASA's Osiris-Rex mission has passed a crucial milestone, moving from the design and development phase to the spacecraft-building stage, agency officials announced Monday (March 31). Osiris-Rex, whose name is short for Origins Spectral Interpretation Resource Identification Security Regolith Explorer, is scheduled to launch in September 2016. If all goes according to plan, the robotic probe will rendezvous with a 1,650-foot-wide (500 meters) asteroid named Bennu in 2018, grab at least 2.1 ounces (60 grams) of space rock material and bring the sample back to Earth in 2023. The mission aims to shed light on the solar system's early days and how Earth came to possess the carbon-containing building blocks of life, NASA officials have said. Bennu is a potentially hazardous asteroid, so Osiris-Rex could also have planetary-defense applications. Osiris-Rex's just-met milestone, called Key Decision Point-D (KDP-D), is a type that comes after a series of independent reviews into a mission's finances, schedule and technical aspects. This artist's concept depicts OSIRIS-REx spacecraft carrying out the first U.S. mission to return samples of an asteroid to Earth. The KDP-D meeting was held Sunday (March 30) at NASA Headquarters in Washington, D.C., agency officials said. Aerospace firm Lockheed Martin, which is building the Osiris-Rex spacecraft for NASA, began assembly operations in Denver on March 27. Over the next six months, Lockheed Martin technicians will install many subsystems on Osiris-Rex's spacecraft "bus," including its avionics, power and telecommunications systems and the mission's five scientific instruments. The probe should be ready to begin environmental testing this fall, Lockheed Martin representatives said. Osiris-Rex will be the first U.S. asteroid-sampling mission, but the not the first one worldwide: Japan's Hayabusa spacecraft collected pieces of the asteroid Itokawa and returned them to Earth in 2010. The nation's Hayabusa 2 mission, another sample-return effort, launched in December 2014 toward a space rock called 1999 JU3 and is expected to reach the asteroid in 2018. NASA is also developing its Asteroid Redirect Mission, which aims to pluck a boulder off a large asteroid and drag the piece into lunar orbit, where it can be visited by astronauts. ARM's current schedule calls for the robotic capture probe to launch in 2020, and for the first astronaut visit to come in 2025.